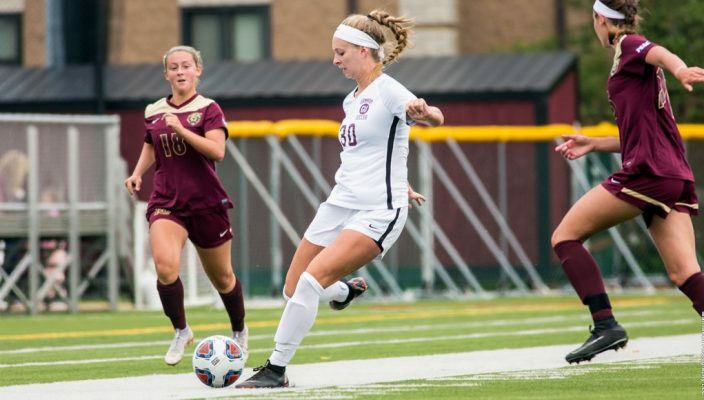 The Gannon University women’s soccer team faced two close battles last week, beating Edinboro, 2-1, Wednesday on the road and falling on Saturday to visiting Kutztown University, 1-0. The split left the Knights 3-1 overall and 2-1 in Pennsylvania State Athletic Conference action going into Wednesday’s 4 p.m. matchup against Pitt-Johnstown at McConnell Family Stadium. Gannon went down early against Edinboro as the Fighting Scots’ Danielle Chatten scored off a pass from Cameron Bunjnoski in the game’s 23rd minute of play. But just 18 seconds later, Taylor Lewis struck back for the Knights with her fourth goal of the year on a breakaway from 15 yards out to tie the score at 1-1. The goal gave Lewis at least one goal in the first three games and she is also among the PSAC leaders in scoring and goals. Gannon’s 9-3 shooting advantage in the second half showed as Hannah Hays scored the game-winning goal in the 75th minute off Vanessa Coccurello’s pass. Edinboro made one last attempt in the game’s final minutes but the effort was stopped short by Gannon’s sophomore goalkeeper, Hannah Pufpaff. Gannon mounted an impressive offensive assault throughout the match, doubling Edinboro’s shot count, 12-6. Edinboro held a 4-2 advantage in corner kicks, and both sides held even on fouls at eight apiece. This marked Gannon’s first 3-0 start since 2015. The Knights were ranked fourth in the United Soccer Coaches Atlantic Regional rankings and they received votes in the national poll. That streak came to an end Saturday, though, when Kutztown traveled to McConnell Family Stadium. The only goal of the match was scored by Kutztown’s Alyssa Ryan in the 15th minute of play from the top of the box. Gannon held a 6-5 advantage in shots in the first half. Pufpaff also recorded a career-high five saves. Following Wednesday’s match against Pitt-Johnstown, the Knights will trek to Bloomsburg to take on the Huskies at 1 p.m. Saturday.